Allard motors may only have produced cars for a little over a decade, but in that time quickly established a reputation for making sports and racing cars that are still popular on both sides of the Atlantic today. One of the main secrets of Allard’s success, was to combine American muscle with lightweight British bodies. The exact formula that Carrol Shelby and AC used to sprinkle magic into the AC Cobra a decade and a half later. Founded in 1946 by Sydney Herbert Allard, the Allard Motor Company grew out of the similarly named Adlard’s Motors. In its early guise, Sydney’s company initially produced vehicles specifically to compete in trials events. The first true Allard car was built in 1936 using a Ford Model 48 chassis, the tail and scuttle of a GP Bugatti Type 51, and a 3622cc Ford Sidevalve V8 engine. It was dubbed ‘CLK 5’ after its number plate and helped Sydney to achieve his first victory at the Southport Sands 50 mile event, winning at speeds of over 100mph. The following two years saw many other wins for Sydney in CLK 5, leading to requests for replicas that encouraged him to establish the Allard Motor Company. The J2 and J2x are the marque’s stand out post-war superstars that were produced following the creation of the Allard Motor Company. Launched after the end of World War Two and developed for the US market, the J2 saw a Ford ‘flathead’ V8 placed inside a lightweight hand crafted aluminium body. Motorsport success quickly followed with third place in the 1950 Le-Mans 24 hour race and overall victory in the 1952 Monte Carlo Rally, both with Sydney Allard behind the wheel. American racers loved the J2 not only for their speed but their mechanics could work easily on homegrown engines they had grown up with. Following the J2 were the P1 saloon, K3 two-seater sports car, the Palm Beach two-seater, and finally the Palm Beach MKII GT in 1956. Although it didn’t find its place in the market, the K3 featured a powerful Chrysler Hemi engine with a pair of 4-barrel carburettors. Now a sought-after rarity it has been known to fetch close to a quarter of a million US dollars at auction. 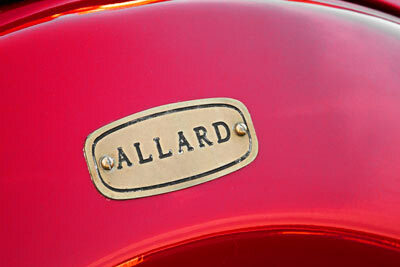 A simple badge, featuring the Allard name on a red background, it is still used on Allard’s aluminium motorsport components but will be best remembered for the stylish chassis it appeared on in the early 1950s. The motor industry advanced rapidly in the 1950s and combined with a recession in the USA, Allard’s business declined rapidly in the late 1950s. The marque struggled to stay solvent. In total it produced over 1,900 cars before sadly closing its doors in 1958. Sydney Allard passed away in 1966 but the Allard name has lived on thanks to his son Alan, and grandson Lloyd, who still produce premium motorsport components. If you’re an Allard owner, be sure to check out our owners’ club page to find out about clubs near to you, or for information about club meetings and events.